Mi quang is to Da Nang as deep-dish pizza is to Chicago. If the SAT’s had more analogies like the one above, I would have scored much higher than 1170. Somehow, even with the boring analogies, The Astronomer managed to score a cool 1570. Genius! The Astronomer and I were only in Da Nang for a day the other week, but we made sure to pencil in a little mi quang action. We dined at Mi Quang 1A based on a recommendation from our friend Cathy before catching our flight back to Saigon. The restaurant was large, lit in fluorescent lights and laid-back. Pajamas? Check. Kung Fu movie? Check. The eatery offers three different types of mi quang—shrimp, pork, and chicken. We ordered a bowl of each; I had the shrimp, while The Astronomer went for a bowl of pork and a bowl of chicken. I’ve covered the ins and outs of this dish before and was really impressed with 1A’s execution. Even though they replaced my beloved sesame cracker with a shrimp chip, the mi quang tom was a fabulous bowl of noodles. Whereas the mi quang in Saigon and San Diego contain a plethora of meats mixed together, 1A compartmentalizes each one. However, the broth is the same regardless of the meat of choice. This was The Astronomer’s first time sampling the classic Da Nang dish and he had a look of utter bliss on his face as he polished off his two bowls. He commented that the broth was perfectly subtle and yet flavorful, kind of like Hue’s com hen dish. He preferred the pork rendition over the chicken because bones are difficult to deal with in a noodle soup. Since our return home to Saigon, The Astronomer has eaten a number of bowls of mi quang from a few different establishments to see how they measure up to Da Nang’s. Thus far, he has yet to encounter a product as fine as Mi Quang 1A’s. 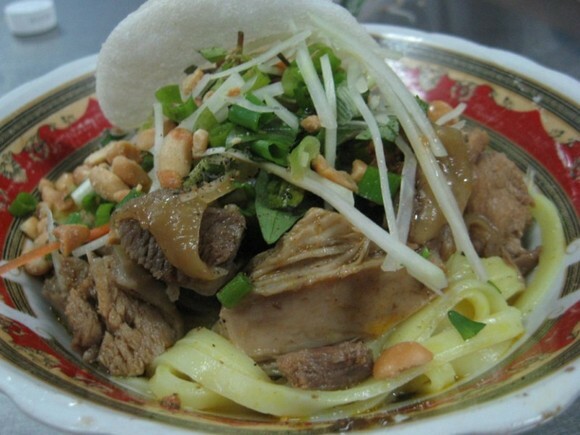 Mi Quang is one of the strangest dishes in the Vietnamese repertoire — half noodle soup, half noodle salad. The broth functions like a dressing for the other ingredients. Sorry that you didn’t get toasted banh trang nuong (sesame rice cracker) to round things out. The banh phong tom shrimp chip is a decent stand in. Maybe we went on an off day, but the Mi Quang here was just okay. Funny thing is we’ve had better in the states! Da Nang wasn’t the treasure trove of good eats that we thought we would encounter, but there were some gems in the alley ways. Just a couple of blocks down the street in an alley is a place that serves up one of the better bowls of bun bo hue. Very generic sounding name though – Bun Ba Dao. It’s close to the bridge. We were told by locals that there were some good bun ca places in the alley’s too, but we didn’t get a chance to check them out unfortunately. Hopefully on your next visit you’ll get a chance to try the alleyway goods and blog about them. I would love to see the pictures to remember the experiences we had in vietnam. Hey folks, i have been to this place and i would say that it s the best spot for Mi Quang in Da Nang. They have been running this business for many generations. My grandma house is about 10 minutes walking to there!!! I spent most of my youth in Danang. 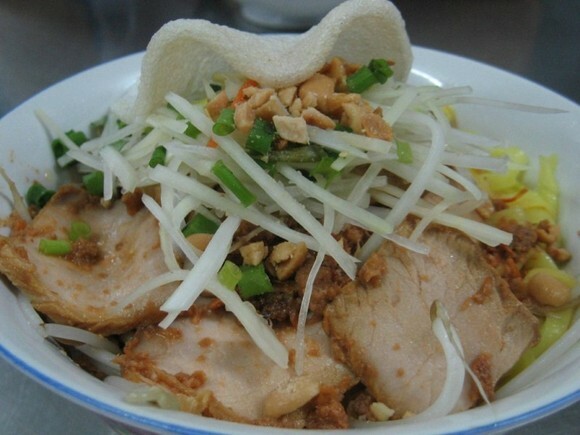 I appreciate your interest in Mi Quang, the most popular dish of my countrymen. But 1A HaiPhong is not the right place to know what MiQuang is to be like. In short, if you haven’t been to MiQuang Ba Ngan ( Madam Ngan )on Dong Da st., and Nui Thanh st.,, you will never know the meaning of Mi Quang of Quang Nam. Youn can also find it out in Saigon at Phu Chiem restaurant and Madam Hoa ’s inn in Tan Binh distrist, or Hoang Cung restaurant in Cantho city, Mekong Delta. Only sesame rice cracker can accompanize Mi Quang, never shrimp chip. He who interests in Mi Quang can contact me for the long winding story of Mi Quang. If you’re ever in the southbay area (redondo beach, torrance) go to a spot called Van Ha. They have good mi quang. I’ve had Mi Quang at 1A and at other places around Vietnam. However, I find the best mi quang is in Dalat. There’s a woman in the alley next to Doan Thi Diem Elementary School that sells it from 7-8AM ish. If you get there after 8;30AM, most of the time it’s gone. There’s an afternoon place at Ap Anh Sang, Ba` Xi (Madam Xi) but it’s deep within alleys and alleys so will be extremely difficult to give directions. Everyone around there knows where it is so just ask around. She opens around 2PM, don’t bother coming after 4PM because she’ll be sold out. Not alot of restaurants in the US serve mi quang. 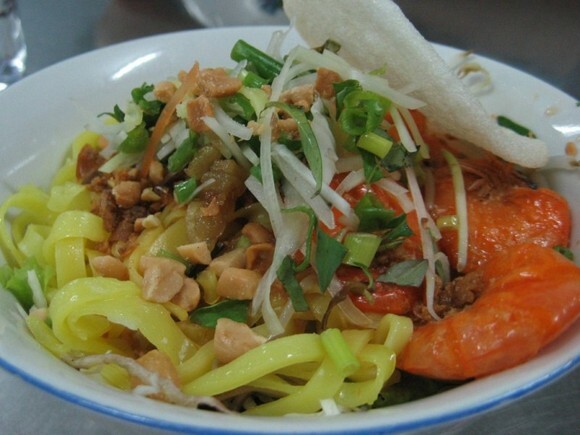 This is among one of my fav noodle dish that my mom makes, whose from DaLat. She learn to make this dish when she was young, from a woman down an alley selling mi quang. 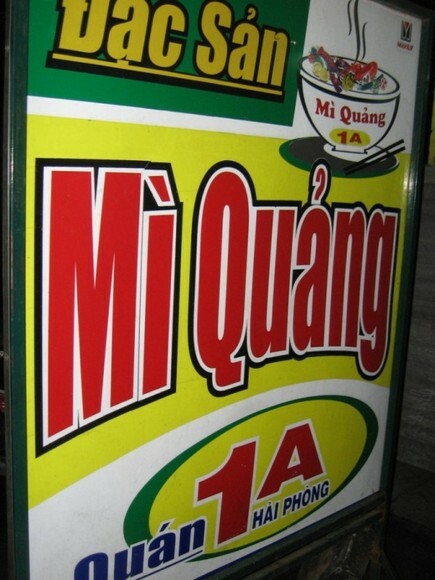 Does anyone know where I can get some decent mi quang in Saigon?? 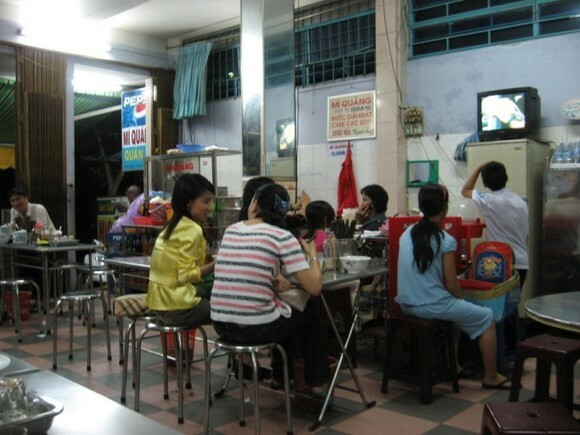 Vickie – I’m a big fan of the mi quang at Bun Bo Hue Yen Do in District 3.